At 10 days old, micro greens have their first set of leaves and areready to snip. Micro greens are showing up in appetizers, sandwiches, and salads in innovative restaurants across the West. They’re easy to grow from seed and require little space. These flavorful greens are the young seedlings of familiar mustards, cabbages, radishes, beets, and other greens. Simply harvest them shortly after they sprout. Colors: Depending on the seed mix, micro greens can be a blend of varying green shades, but may also include bronzes and reds. Seed mixes come in mild and spicy types. 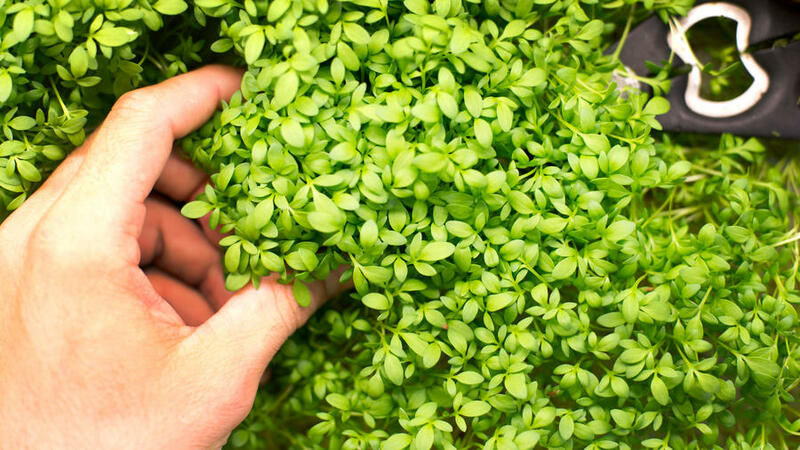 Size: Micro greens are intentionally harvested when they’re very young, often under 2 inches tall. Planting: In mild climates, micro greens can be grown outdoors year round. In cooler regions, you can grow them outdoors anytime except winter at which time you can grow them inside in bright light. If growing in the ground, till in 3 to 4 inches of compost or other mature organic material into the soil. If growing in containers, use a container that’s at least 10 inches wide and fill with potting soil to about an inch below the rim. Sow seeds 1/8 inch deep (mix seeds with fine sand to help with even distribution). Care: Grow in full sun, and keep soil moist. Fertilize every other week with fish emulsion, or use a granular organic fertilizer according to instructions. Harvesting: Micro greens will be ready about 10 days after seeds are sown. Clip clusters just above the soil line right after the first set of true leaves forms. True leaves follow the initial, simple-looking seed leaves and look more like the mature plant. Companions: Plant alongside greens like kale, chard, and lettuce that you’re letting grow to maturity, and include some edible flowers like pansies and violas in the cool season or nasturtiums in the warm season.